STUDIO TOUR: Welcome to my (almost) plastic + waste free studio! Since my artwork + creative process is all about human connections to wilderness and the small daily steps we all do in support of the environment - I thought you might enjoy seeing how this affects the things I use on a daily basis in the studio. I've been working on eliminating plastic and waste from my workflow but this process is ongoing. I'm not perfect, my workflow isn't perfect, but for me knowing the direction I'm heading is a powerful thing. I've included improvements planned for 2017, because it's fun to share those tweaks. Right now (of course!) my business is on the small side. I hope that doing this foundational work and making mindful environmental choices now will make it easier to have minimal impact as my work, studio and practise expands. PAINT: I use all single pigment watercolour paints from Daniel Smith out of Seattle. I like that their 15 ml tubes are metal rather than plastic. The tiny plastic lids can be cleaned and recycled. These tubes last me years sometimes, as I've got a rainbow of colours on the go ... and my paintings are quite small! PALETTE: I use an aluminum palette the size of a business card. The individual pans are removable and refillable. They are made by an expeditionary artist out of Seattle and the most brilliant travel palette I have encountered. This is what I use in the studio, in cafes, on the trail or on the beach. BRUSHES: a motley crew. I'm always on the hunt for quality, plastic free brushes but I have not yet found one brand worthy of my love. PAPER: I use 100% cotton rag papers made Arches. The 140 lb and 300 lb are my favourites. Last year I transitioned from Fabriano, who have a family run factory in Italy and are fairly transparent with their environmental impacts. I started using Arches because to me, the product feels superior and a better fit with my work. I'm still researching the details of Arches factory + business practises in relation to the environment. INK: I have a few calligraphy pens and I use bottled inks for filling out things like certificates of authenticity and writing notes to collectors. PENCIL: I use a refillable pencil I bought from the Regional Assembly of Text. It's made of wood and metal and works like a charm ... Now, if only I could find a source of lead that didn't come in a ridiculously excessive plastic and paper package! TRAVEL: I have a small Pelican case that comes with me backpacking, paddling, biking or anywhere that I'm painting outside. It's plastic but not disposable. It was given to me preloved and will probably last forever. PENS: Right now, I have an ever evolving roster of micron pens on the go at all times. I'd like to switch these out for a refillable option this year. SKETCHBOOKS + NOTEBOOKS: I'm a fan of Moleskin. The papers are beautiful and they are available everywhere. The drawback is that they are wrapped in plastic and the covers are questionable in terms of recyclability. In 2017 I'll be transitioning to Paperback Note, a Vancouver company that makes sketchbooks out of old book covers. At first I was skeptical of the quality because of the recycled factor. When I learned the company is run by a local architect named Herman, I began to understand why these notebooks are beautiful in form and function. Herman uses heavy, bright white papers and binds them individually in a lay flat format. The covers come from comic books, old paper backs and add a sassy, fun element. The covers are either paper based or fabric on the fancy old ones. WASHi TAPE: did you know washi tape is made from rice paper? It's a great alternative to clear plastic tapes. High quality washi tapes are acid free and lingin free but the adhesives are not archival. That means they are only used on layers not touching the artwork, otherwise they could cause changes in paper or pigment colour over time. GIFT WRAPPING: artwork is gift wrapped in kraft paper or old maps. Any ribbons used are thrifted from secondhand + curiosity shops, or recycled silk sari ribbons purchased from Etsy. Anything bought new is made of natural fibres like hemp or cotton. Baker's twine is a reliable go to with no plastic content. LOVE NOTES: I collect vintage postcards and right now, this is what I write thank you's and notes for collectors on. My favourite ones are a collection of old wilderness photographs from locations around Vancouver, about 100 years ago. PACKAGING: this year I'm using strictly kraft paper mailers. Since small unframed prints and paintings are shipped as letters, upgrading to a coated envelope would not offer much more safely in terms of moisture damage. I replace any artwork that arrives damaged and that has not yet happened, though I know it may eventually! ENVELOPES: made of 100% recycled fibre, or found from my favourite recycled materials art shop, Urban Source. PRINT MATERIALS: I don't use business cards but I do print postcards and Certificates of Authenticity from Moo. I love this company! Their customer service is impeccable, they share so much useful information and the products are on point. The drawback is that even when I order the 'greenest' paper option, it arrives in a plethora of beautiful, heavily coated packaging. This is probably the largest pile of unnecessary waste leaving my studio at the moment. I'd love to find a local print company to work with this year, letterpress or otherwise, for my ongoing print needs. PRINTING: my limited edition, archival quality prints are printed on a heavyweight 100% cotton Moab paper. All digital printing is taken care of by Fidelis Fine Art Prints out of Parker Street Studios. Alan is kind enough to wrap my orders in a parchment vellum and pieces of cardboard. PACKAGING: Prints are wrapped in archival tissue. Soon this will be replaced by transparent vellum parchment envelopes - which is the sexiest paper I know, next to watercolour. PRINT MATERIALS: For me, it's so important to include some key paper pieces in a print order. This keeps collectors informed and makes it clear how they can contact me with questions, feedback or future orders. It also provides some essential information about the artwork. Each thing is thoughtfully printed on recycled paper and can be recycled afterwards. Packaging is kept to a minimum. Each print is accompanied by a Certificate of Authenticity, a postcard with a note from me and a bit of information about the series. I invite folks to email me for a PDF of hanging, framing + care instructions. ADDRESS LABELS: are written by hand or printed on paper and glued onto the envelope. STAMPS: ordering a few branded rubber stamps will allow me to provide consistency when using found, recycled and vintage paper materials. Once I move into my new studio in September, I will also FINALLY get an address stamp. EMBOSSING: the signature on my prints and paintings is written on a raised, embossed circle. This 3D element is created using an architect's metal square with circle cutouts in it. The paper is manipulated using this metal circle cutout shape and an embossing tool, which looks like a pencil but with metal circle knobs on each end. The paper is pressed and pushed to pop out in the shape of circle. I'd love to discover an old school metal punch that creates this simple circle shape, but in the meantime my embossing tool broke this week! (I've had this tool since I was 7, and using to enthusiastically make greeting cards out of rubber stamps and metal stencils.) I'm excited to replace it with a wood or metal handle version. FRAMES: in 2016 I transitioned to a raw Maple, made in Canada moulding. It was the only thing on the market that was untreated and made of hardwood. I was unhappy with the life of the more standard black and white frames I favoured in the past. After being moved a few times or up on display, one in five of these classic frames would end up with chipped edges. The wood frames that I started using last year are BEEEautiful. Not shockingly, they are not cheap either. I've found a solution for this, see below. FRAMING: no, I do not do framing myself. A. it would take FOREVER. B. I have a professional who I trust to the moon and back. Liz McLaughlin is my framer, friend and consultant on all things relating to archival materials. She takes care of all my framing needs and does beautiful, reliable work. I have learned so much from her and am so grateful for her willingness to work with my quirky, ever-evolving environmental standards. I may or may not be her most high maintenance customer but she loves me anyways! 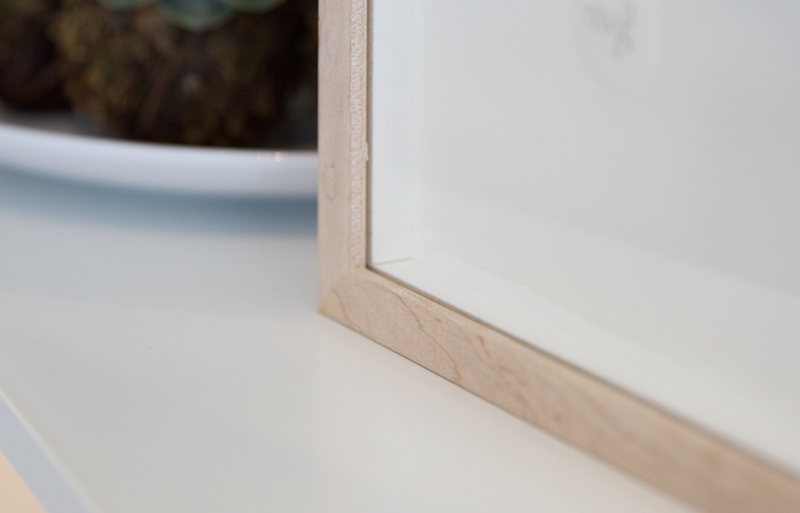 FRAMES: This year I am thrilled to partner with a local woodworker here in Vancouver. Together we are exploring a durable, environmentally sound, hardwood frame that is more affordable than the raw Quebec Maple. We are starting with Poplar, as the patterns and tones of this wood are gloriously neutral and it's half the price of Maple. The Poplar wood grain really lets my paintings shine. Later this year we may get to play with a beetle kill Pine edition or some reclaimed wood.